And not even a particularly good one! For some time, there have been people who have sung the praises of capitalism. With regret, I admit that I once counted myself among the number. That is, until I left my cushy remote working job that didn’t pay well (but which I loved) in favor of a job that paid better, so I could meet my obligations. For years, I had been living with rose-colored glasses on. I was insulated from how things really are. I didn’t see the suffering all around me. I didn’t experience it myself. The people who tried to express their difficulties often proposed government-based solutions, which I have always disagreed with. American socialists often claim that corporations run the government, but that government regulations are needed to restrain corporate power. For that reason, the other arguments they made, however well-founded or well-reasoned, never resonated with me. Being out in the world is like being out in the cold. The world is a cruel place. People judge each other by appearances, even when there’s no logical reason to do so. Company bosses are by turns incompetent, unknowledgeable, racist, nepotistic, and domineering. As long as what they say goes, then their mistakes are accepted and spread throughout the company. The world might have learned from Henry Ford producing the Model T for twenty years straight, even after the car had become obsolete, simply because that’s how Ford wanted it done. However, the old saw about those who don’t learn from history crops up again. 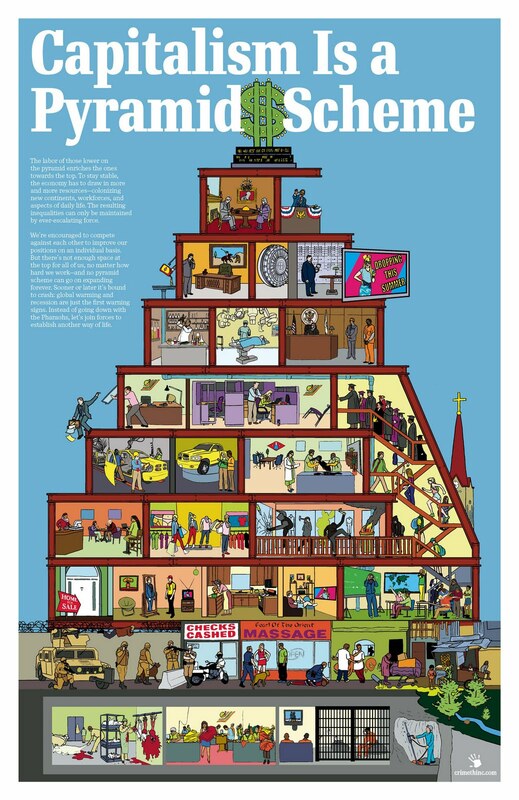 The vast majority of companies employ a pyramid-like top-down structure in which authority is exercised. Whether these companies are private or public makes no difference in the results that come about as a result. The opinions of employees are largely ignored. Company leaders view themselves as having a monopoly on knowledge- largely because they are exposed to information that other employees don’t encounter. They routinely forget, if they even understood at all, that employees are often exposed to information that these leaders don’t get either. A leader can’t be everywhere at once. It’s not likely that he can even remember everything that’s told to him in a single day either. As long as being promoted is viewed as a rare privilege, rather than the burden it most often actually is, company leaders will continue to see themselves as a better type of worker, perhaps as a better type of person. To prove this true, the reader only needs to think about how often they were asked by their boss what action or decision ought to be made next; chances are good that such questions are never posed. Rather, leaders will do whatever they think is best. In this way, it becomes clear that capitalist business ventures do not actually require cooperation between individuals. In order for something to be produced, or for a service to be given, employees need only be obey the dictates of whoever happens to be in charge. Those who don’t or can’t obey, those who are deliberately insubordinate, are sent home. For the purposes of completing tasks, a robot or a computer is actually preferable over a human being. Adaptability is not always a required skill, especially not for most entry-level jobs. For example, if medical data companies could develop a better program that would allow them interpret scanned documents with a one hundred percent accuracy rate each time, they would get rid of every data entry technician regardless of how experienced or capable or anyone might be. If every fast food restaurant could replace cashiers with kiosks and cooks with robotic arms and conveyor belts, they would do so. There are few positions that are completely safe from advancements in robotics, except for (of course) the executives who view themselves above everyone else. Even robots can program other robots. The end goal of any venture thus described is, after all, the acquisition of income. Profit, while not a harmful concept in and of itself, rules all businesses to the point where both employees and bosses are no longer people. One group is turned into interchangeable parts; the other into a kind of deity whose decisions need never be questioned or challenged. Anyone who believes that human interaction between these groups at the workplace is meant to engender an exchange of ideas, or anything resembling cooperation, has perhaps spent too long in a management position. Employees need only cooperate with the decrees they are given. Management need not cooperate with any wish or desire that any employee may have. It is all take and no give. There is no one to whom one may object. There is no authority toward which an appeal may be made. There are only higher levels of management. Beyond that, there are governmental authorities who are often more likely to find in favor of the company rather than the individual- except in cases of egregious abuses (which do happen). The fact that employees only gain concessions by threatening to shut the company down by striking ought to say something about just how the world’s companies are run today, and have always been run. The company’s goals matter; the employee’s goals do not signify for anything. The manager’s orders must always be obeyed; the employee’s observations need not be taken into consideration at any point. Even if such practices drive a company into the ground, there is no way to change it with a capitalist business. Employees may be driven out of the work, their retirement plans voided, their livelihoods ruined, and still there is nothing to be done. There is no way to describe a non-empathetic, one-sided system like this as being a cooperative venture. In truth, neither group of people cannot make money without the other. Employees rely on company leaders to make good decisions to keep the business open and profitable. Company leaders rely on employees to meet production or service goals so that a profit may be derived. Remove either of the people from the equation, and the company ceases to function. Yet, in almost every capitalist venture everywhere in the world, the one group is viewed as being far more important than the other. Nothing more than individual hubris drives this view forward, even when plain facts repeatedly suggest otherwise. It is as if the world’s managers prefer to stomp on anyone worker in their company, however that money, rather than blood, will come out. Only an almost-complete monopoly on all the world’s business allows capitalists to operate in such a manner; it is almost certainly true that if anyone could make just as much money, perhaps even a little less, working at a cooperative business where everyone’s opinion counted equally, they would do so. There is a very good reason why some people choose to become South American goat farmers, after all.